Many people are vowing to get healthy in the New Year by losing weight and changing bad habits. But the majority of those resolutions fail; primarily because they are vague and lack a real strategy. Changing your emphasis to improving performance can help you succeed this year. Enhancing performance of every cell and organ in your body is the best method for optimizing your health and well-being. Here are a few tips on how to make your New Year’s resolutions successful. Telomeres are the part of your chromosomes that control aging. They represent your biological clock and are the strongest indicator of how quickly you age. When you are young your telomeres are longer and progressively shorten with age. But the rate at which that shortening occurs is directly influenced by lifestyle choices. In addition to naturally shortening with age, telomeres have been shown to shorten in response to stress, smoking, obesity, lack of exercise and an unhealthy diet. At any age, shorter telomeres dramatically increase your risk of serious disease and premature death. You will look and feel older. Telomere length can be measured with a simple blood test. Once you have your result, if your telomeres are short, there is no need to panic. Fortunately there are things you can do to boost their length, make your cells act younger, avoid age-related problems and restore your youthful vigor… at any age! Exercise has been called the closest thing we have to a fountain of youth. The goals of any exercise program should be to improve your ability to function; better fitness, increased strength, and improved flexibility. At all costs, you want to avoid sarcopenia – the age related loss of muscle mass. Loss of muscle mass leads to reduced strength and decreased physical activity which ultimately can lead to frailty and dependency. Maintaining muscle mass, muscular strength, muscular power and endurance are all essential to maximizing performance and aging more youthfully. At the cellular level, exercise improves telomere maintenance by increasing the activity of the enzyme telomerase that builds and repairs telomeres. You don’t need a lot of equipment to keep your body primed. Most elite military troops rely on calisthenics to maintain their fitness, muscle mass and strength. Rest and recovery are just as important as the exercise to allow your body to rebuild and recuperate. There are many different diet strategies and zealous advocates promoting each one. The bottom line is there is not one single way to eat that is ideal for everyone. Customizing dietary recommendation based on your individual genomic blueprint is the ideal way to determine what you should be eating and avoiding. But in general terms, a Mediterranean style diet is a great starting point. It has been shown to promote good health and reduce risks of many chronic diseases. For optimizing hormones and performance you will want to remember two overriding principles to incorporate into your eating plan; eat plenty of healthy fats and avoid sugars and excess simple carbs. 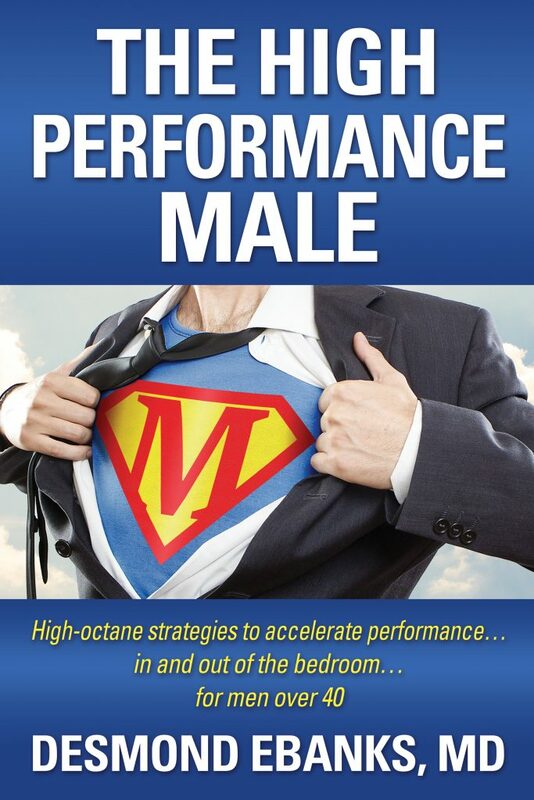 For more information to help you become the best version of yourself, pick up a copy of my new book The High Performance Male—high octane strategies to accelerate performance…in and out of the bedroom…for men over 40.